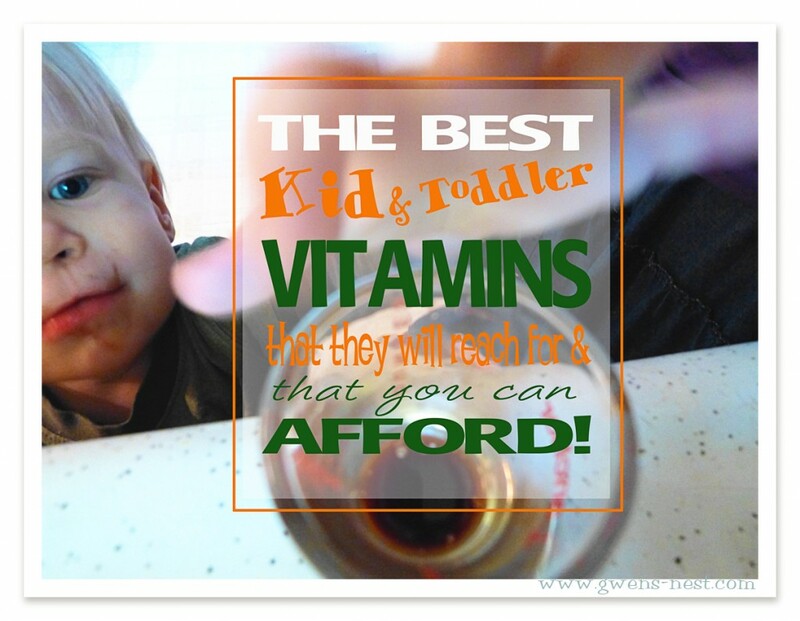 Looking for the best kid vitamins? I shopped and tweaked for years, and the kids and I are now truly in love with the daily vitamins that they take. They meet the needs of tasting good, not requiring a toddler to swallow pills, and most of all, they meet my standard of not having any synthetic vitamins. So I feel good that the kids are able to really utilize the nutrition much better. 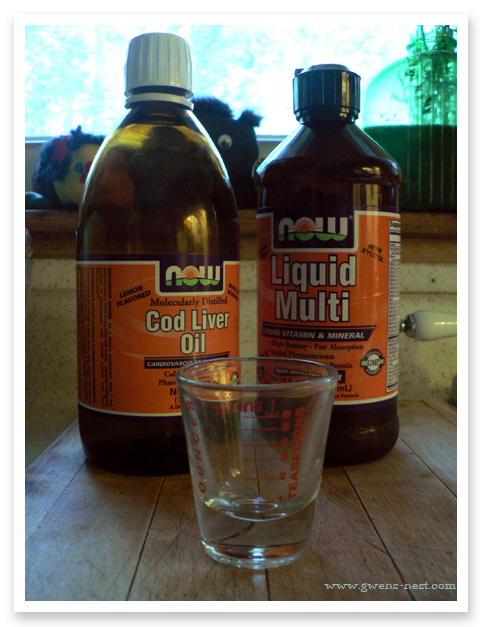 When my oldest two were toddlers, I began using NOW berry flavored liquid multi vitamin, as well as lemon flavored cod liver oil (affiliate links), to add in vitamin D, and the healthy omega 3 oils. Believe it or not, the kids loved the flavors of both! 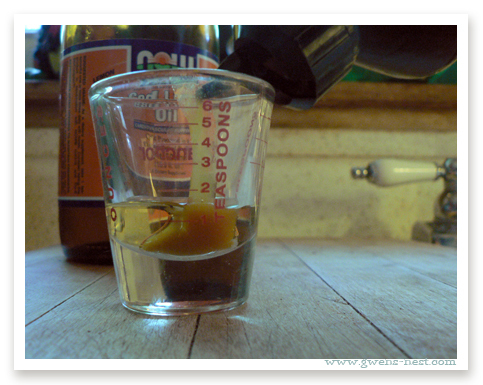 I eventually found this cute little measuring shot glass (kitchen aisle of my local big box store! 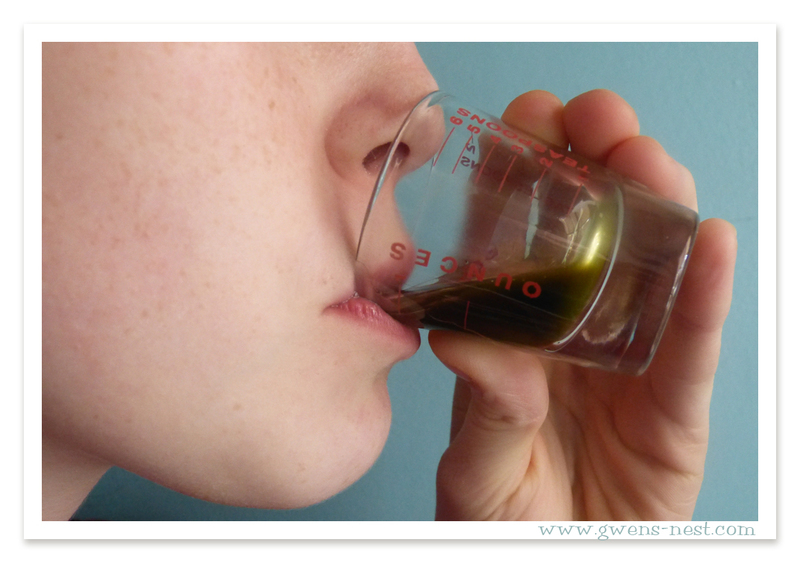 ), and started just measuring both into one glass. 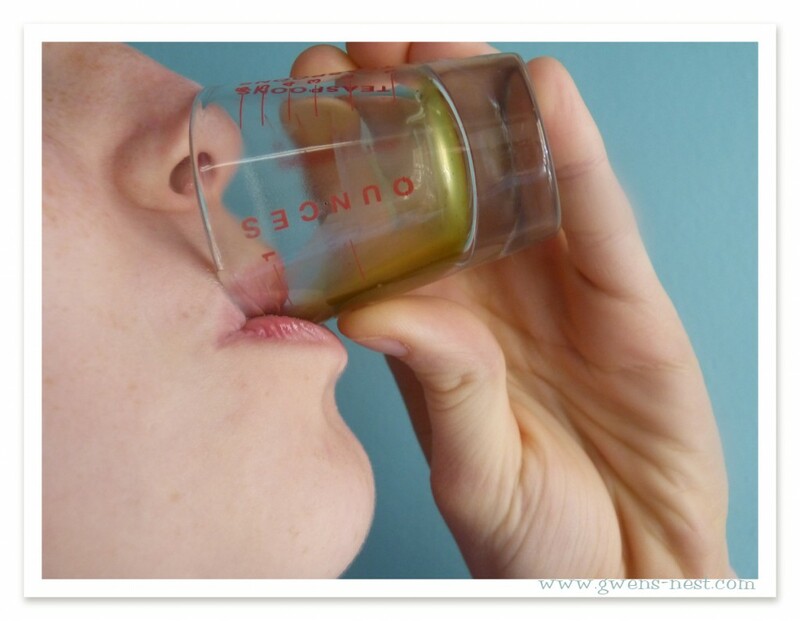 The two liquids don’t mix, but the flavors meld really well, and the kids LOVE taking it this way. My 5 year old just told me yesterday, “They put the sweet stuff in there, AND the good for you stuff in there too!” Really, what more could you ask for? 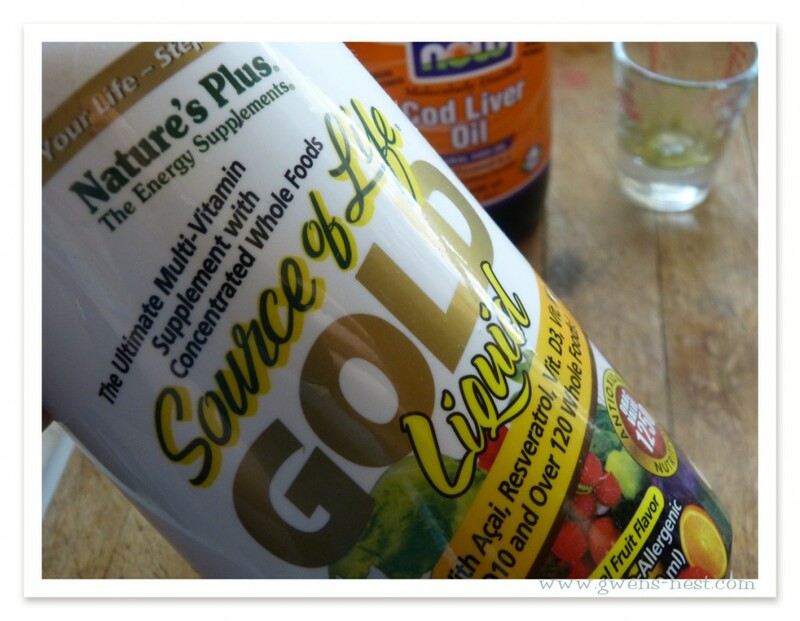 The last time we ran out of vitamins, I found a really great deal on this whole food vitamin, Nature’s Plus Garden of Life Gold, (affiliate link) so that’s what we’ve been using. It’s a *fantastic* (and usually very pricey) vitamin supplement. And it rocks. I even take it on days when I need an extra boost of energy. It’s a tropical fruits flavor, and actually tastes REALLY good! The adult serving is 2 T. Since the NOW adult size serving is 1 T, and children over 4 take 1 teaspoon. I use that as a guideline, and just give the older kids 2 t. of the Liquid Gold, and 1 t. of cod liver oil. The little guy gets 1 t. of each. I’ve always loved NOW products as well…they have *extremely* high standards, and offer top quality supplements and products at really great prices. And neither of these two companies have idea that I even exist…this is in no way a paid endorsement. These are just products that I love and what I think are the best vitamins for kids. I usually buy from Lucky Vitamins online, or from Amazon …I love the Super Saver Shipping items…they give you free shipping on $25 or more. Here are the links for my favorite vitamins for the kids! And the best part? Moms, and even Grandmas can take these same vitamins…perfect for those who don’t like to swallow pills. Want more options? I’ve collected the best vitamins and supplements for kids in my Amazon Affiliate store, including some highly recommended whole foods gummies! Follow me on Pinterest and never miss a natural remedy post! Follow Gwen’s Nest’s board Gwen’s Nest Herbs & Natural Health on Pinterest. Gwen, I can’t find the NOW brand liquid cod liver oil on Amazon. Do you know if it’s still available, or is there another brand you recommend? There are so many! They may have stopped carrying it. I like the Carlson brand or the Cinnamon flavor of Green Pastures fermented (you use less of the fermented, so that tends to level the price difference out because it lasts longer). I give my kids kid calm by natural vitality. It has the fish oil in it. Do you have a source for oral vitamin k for newborns? This would be in lieu of the shot at the hospital. I’m also ordering some for me to take leading up to birth. I don’t…this would be a great question to ask over on the Gwen’s Nest Herbal Chick Chat Facebook group! Thanks for this! I’m almost out of a kind that I don’t love and was at a loss for what to buy next. Have you ever heard of juice plus? I have a friend that sells them and loves them but because it’s a mlm, I question if it truly is the best… I’m sure it’s good but is it worth the price if there are better alternatives. Also, how long do these bottles last you? 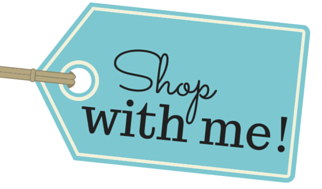 I am a mum of 4 living in Toowoomba, Queensland, and have just discovered your site. I would love to find a liquid vitamin supplement available in Australia similar to this one. Do you know of anything? Hello! What dose do/did you give your little guy of the NOW brand? I can’t remember, as this was several years ago now. 🙂 I based in on weight, though. I think I divided an adult dose down to figure out the doses for my kids and half of that for him? Ok sounds good, thanks . I have 4 daughters 6 yo to 9 mo, the vitamins kill my food budget, but the 2 yo is an extremely poor eater. I’m looking forward to her reaching an ‘age of reason’ about this lol. Take care!